One of our clients - a telecommunications and media company - needed help with their contingent workforce. The client called us in because they were in the middle of a restructuring transformation and needed our help with their contract labor workforce. They were completely decentralized, each business unit had its own process, and there was no standard rate card in place. We started the relationship working on their contingent labor division, then expanded across multiple divisions including everything from IT, to collections, to call centers, to marketing. Our solution was to simplify the acquisition of independent contractors and temporary resources, optimize value with vendor management, and provide insights into current and future contingent spend for better decision making. 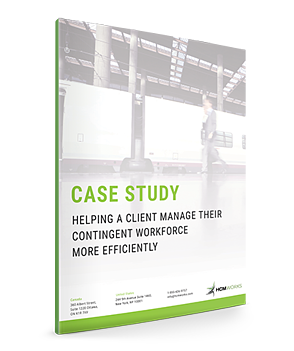 Fill out the form on the right and discover how our solutions helped this client manage their contingent workforce more effectively.